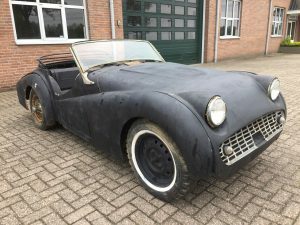 This 1959 Triumph TR3A has been in storage for 25 years. It looks to be a matching numbers car and would be an excellent candidate for a ground up restoration. Original body colour Pearl White, with traces of a red interior. The car was painted over in red, and covered in black primer prior to storage. The Triumph's chassis has a lot of rust damage (frame rails and rear cross members). We would advise against repair, as new TR3A replacement frames are available from reputable suppliers. The body is in restorable condition and has rust damage in most of the common weak areas (floors, sills, boot floor, battery box). The body panels appear straight and solid, but the lower parts of both front fenders have been 'repaired' in the past. The engine is frozen and will need a complete rebuild. The standard 4-speed (no overdrive) gearbox shifts into gears, but will probably also need a rebuild. 89.571 mls on the odometer. The Triumph appears to be mostly complete, missing only the seat frames. 3 steel wheels and 2 wire wheels, including 4 extra wire wheel hubs. It comes with a US title (Ohio) and EU import documents (duties paid). 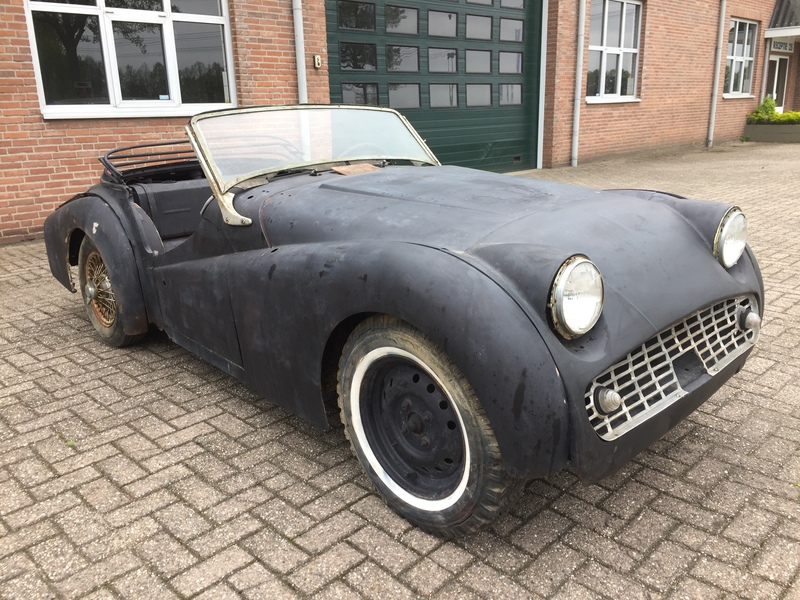 We can deliver this Triumph TR3A throughout Europe at competitive rates.